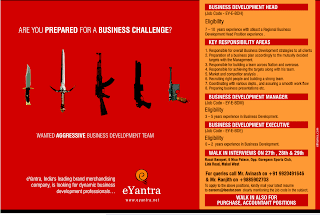 Our recruitment advertisement that we had put in TOI got the Pink Slip Award for best recruitment ad. Kudos Ethames!! Funny name for a recruitment ad award - Pink Slip... ROFLMAO. BTW, what's this 'geek code' on the sidebar? @lucifer - www.geekcode.com, check it out. Will check with don, we just finished filling the questionnaire by the TOI guys.